I couldn't resist any longer. I had to make another bracelet to go with my jeans, you know, something blue. 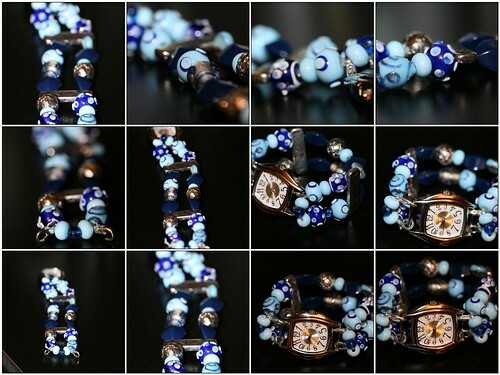 I found the perfect beads too--handmade polka-dot light blue and dark blue. The moment I saw them, I knew that they were supposed to be for my bracelet. I sure love it! 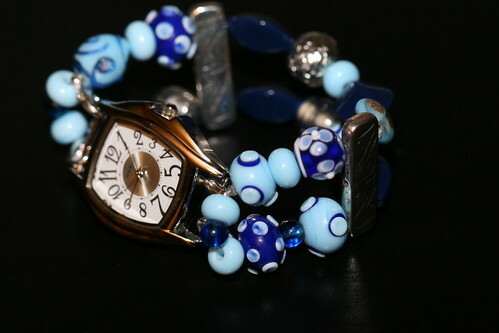 The polka-dotted beads are handmade out of glass (my pictures do not do them justice). I don't know how they do it, but I love the uniqueness of them and I wish I could learn to make my own beads (idea coming up in my head!). I was visiting this evening with a friend and I had to admit to her that I made another bracelet, it appears that although I am not knitting/loom knitting right now, my mind still wants to design/create something. I am glad I found the watch bracelets as an outlet for the creativity bug. I just made a watch this week with Ali Marchant. She's been making them awhile, and saw a watch face and picked it up for me. I'm anxious to make more. The one I made is black and white. I think I need brown and blue to start with. We should wear them to church on Sunday and be twins! My sister Sara just came by. I guess she is doing the triathlon tomorrow too. Have fun! Me likey! Me want one! Stop tempting me to go buy more beads. Beautiful Isela. I've been to busy to loom or knit too. Have a great 4th.